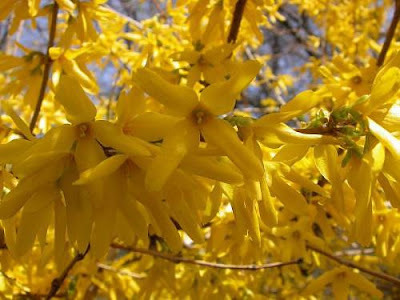 Forsythia is a beautiful flowering plant , native to China and was discovered by Robert Fortune a great eighteenth century plant hunter. It was named after William Forsyth who was Director of the Chelsea Physic Gardens in 1770, and one of the founders of the Royal Horticultural Society. I love the way it blooms before the leaves push through, because you can pick and display the budding branches and watch the pretty lemon flowers open day by day until it is in full bloom. and this is what I picked two days ago, nearly in full bloom, heralding he Spring! I see what you mean about the yellow...isn't it such a cheerful colour? Perfect for Spring. Apparently yellow is used a lot in the advertising world as being the colour which draws the most attention! 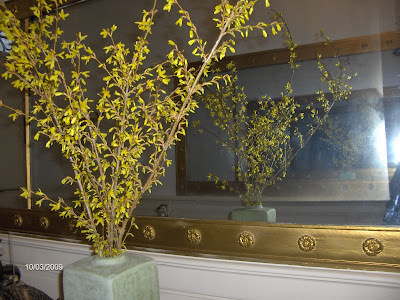 I love the yellow and forsythia takes me back to my childhood in Kansas. We had many bushes lining the backyard.